TAMPA, Fla./OCEANSIDE, Calif. – The IRONMAN Foundation® will distribute more than $33,000 in charitable giveback to nonprofit initiatives and groups in the greater Oceanside area in conjunction with the 2019 IRONMAN® 70.3® Oceanside triathlon taking place on Saturday, April 6, 2019. This year’s grant funding brings the total giveback to $268,840 given to more than 170 organizations in the region. IRONMAN 70.3 Oceanside will be the official kickoff event for the Gold Star Initiative, a program in partnership between the IRONMAN Foundation and wear blue: run to remember, a national nonprofit running community that honors the service and sacrifice of the American military. Through the Gold Star Initiative, IRONMAN athletes who have served in the U.S. military will carry the American flag during the run portion of the event and present it to a Gold Star Family. This program allows athletes to play a part in the healing process of those families who have lost a loved one in the name of freedom. Tu Tran served as a Communications Officer in the United States Marine Corps in both Iraq and Afghanistan from 2005 to 2015. An accomplished endurance athlete, Director of Team Wattie Ink: Elite Team and Hit Squad and a current Microsoft employee, Tran will carry the flag in honor of USMC Lieutenant Corporal Abraham Simpson, who was hit by a rocket propelled grenade in the Second Battle of Fallujah in 2004 and killed at the age of 19. Simpson was the oldest of three sons, all of whom served. His mother, Maria Simpson of Chino, CA, will receive the flag. To further support the healing process, Gold Star families will be provided with scholarships to participate in the wear blue Gold Star Race program, providing them with access to training, support, and entry into various running events, empowering them to process their grief and heal though running. The IRONMAN Foundation will host its third annual Junior Seau Foundation Adaptive Youth Surf Clinic presented by Challenged Athletes Foundation on Sunday, April 7, 2019. The event will include specialized sessions for youth, women and military/adults with physical challenges and will be held in conjunction with the 2019 IRONMAN 70.3 Oceanside triathlon taking place on Saturday, April 6. The clinic will host three specialized sessions that will total up to 30 children, women and military/adults with physical challenges who will spend the morning learning to paddle and surf at Oceanside Pier with the assistance of volunteers, including professional and age-group triathletes and coaches. The Junior Seau Foundation Adaptive Surf Clinic presented by Challenge Athletes Foundation provides the opportunity for participants with physical challenges to learn how to surf, improve their skills, and ultimately share in a lifestyle sport that so many in Southern California enjoy. The clinic celebrates the legacy of Junior Seau, the former San Diego Chargers linebacker who lived in Oceanside and surfed regularly. Paula Newby-Fraser: Eight-time IRONMAN World Champion and IRONMAN and USA Triathlon Hall of Famer, Paula Newby-Fraser recorded a total of 24 IRONMAN race victories in her career spanning 1986-2002. “The Queen of Kona” also joins the 2019 IRONMAN Foundation on the Ambassador Team. Mike Reilly: The official “Voice of IRONMAN” worldwide and a member of the IRONMAN Hall of Fame, the USA Triathlon Hall of Fame and the Running USA Hall of Champions, Reilly is the only person to have been inducted into all three. He has announced more than 180 IRONMAN triathlons and, for the third year, he currently serves as the IRONMAN Foundation Ambassador Team Captain. Daniela Ryf: Four-time IRONMAN World Champion and four-time IRONMAN 70.3 World Champion, Ryf is a native of Switzerland who represented her home country in the 2008 and 2012 Summer Olympics. She currently stands as the only professional triathlete in history to win four IRONMAN and IRONMAN 70.3 World Championships. Sarah True: IRONMAN Foundation Pro Ambassador and two-time Olympian, True was the top female professional from the United States at the 2018 IRONMAN World Championship brought to you by Amazon, finishing in fourth place. 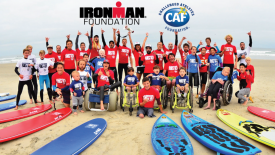 To register for the IRONMAN Foundation 2019 Junior Seau Foundation Adaptive Surf Clinic presented by Challenged Athletes Foundation as a participant, surf coach or volunteer, please visit www.ironmanfoundation.org/oceanside. Junior Seau established the Junior Seau Foundation in 1992 to raise money and resources for programs that inspire young people to face life’s challenges with enthusiasm, hope and dignity. The Foundation assists programs and activities that educate and empower young people, including through the support of child abuse prevention efforts, drug and alcohol awareness, anti-juvenile delinquency programs, and youth oriented educational programs. The Junior Seau Foundation has donated over $4 million to local youth organizations and other such worthy causes in San Diego County since its inception. The Challenged Athletes Foundation® (CAF) is a world leader in helping people with physical challenges lead active, healthy lifestyles. CAF believes that participation in physical activity at any level increases self-esteem, encourages independence and enhances quality of life. Since 1994, more than $80 million has been raised and nearly 15,000 funding requests from people with physical challenges in all 50 states and dozens of countries have been satisfied. Additionally, CAF’s outreach efforts reach another 60,000 individuals each year. Whether it’s a $2,500 grant for a handcycle, helping underwrite a carbon fiber running foot not covered by insurance, or arranging enthusiastic encouragement from a mentor who has triumphed over a similar challenge, CAF’s mission is clear: give opportunities and support to those with the desire to live active, athletic lifestyles To learn more, visit www.challengedathletes.org.